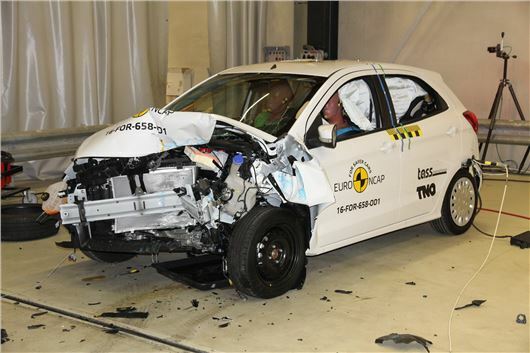 Ford’s new Ka+ and the revised Fiat 500 achieved an underwhelming three star rating in the latest round of Euro NCAP crash testing. The new Citroen C3 was awarded four stars. Ford will be concerned with the performance of the new Ka+, especially following the terrible two star crash safety rating given to the Ford Mustang in January. The Ka+ was marked down due to a lack of rear seatbelt pretensioners and load-limiters, which are now standard on the majority of new cars along with a lack of chest protection. In the other results, the new Land Rover Discovery, Audi Q5 and the Toyota CH-R all gained the maximum five star rating for safety. The CH-R was one of the best performers with an impressive 95 per cent adult occupant safety rating while the Q5 was given an 86 per cent child safety rating - the highest rating achieved to date. Land Rover's new Discovery also scored five stars, but in the frontal offset test the driver airbag bottomed out due to insufficient pressure. The recent facelift of the now ten year old Fiat 500 received just three stars, despite the fact it was awarded a five star rating when first tested in 2007. This is, in part, down to more rigorous testing implemented in 2009 which changed the way cars are assessed. The tests are now based on adult protection (for the driver and passenger), child protection, pedestrian protection and safety assist technologies like seatbelt reminders and lane support. The overall star rating critera made the tests harder since the 500 was last tested, meaning its lack of safety technology accounts for its average three star rating. In the full-width frontal crash test, the Fiat showed poor protection of both the driver and the rear passenger seat. Like the Ka+, it also lacks autonomous braking technology, already offered on several models in the same class. “The 500 is an old car by now and the small improvements that Fiat has made on the facelift don’t hide that," Euro NCAP’s Secretary General, Michiel van Ratingen said. "Unfortunately, high hopes for the segment are smashed by Ford by releasing a brand new Ka+ with mediocre safety performance."